Recently, Jake and I discovered two of the greatest things known to man. Sprite Zero and the Market Pantry Cherry Limeade water enhancer (Target brand, in the Kool Aid section). Do you know what combining those two things makes? A really, really good Sonic Cherry Limeade clone! And it's sugar-free, but it doesn't taste sugar-free! Please don't notice that the Sprite bottle is empty... LOL!!! 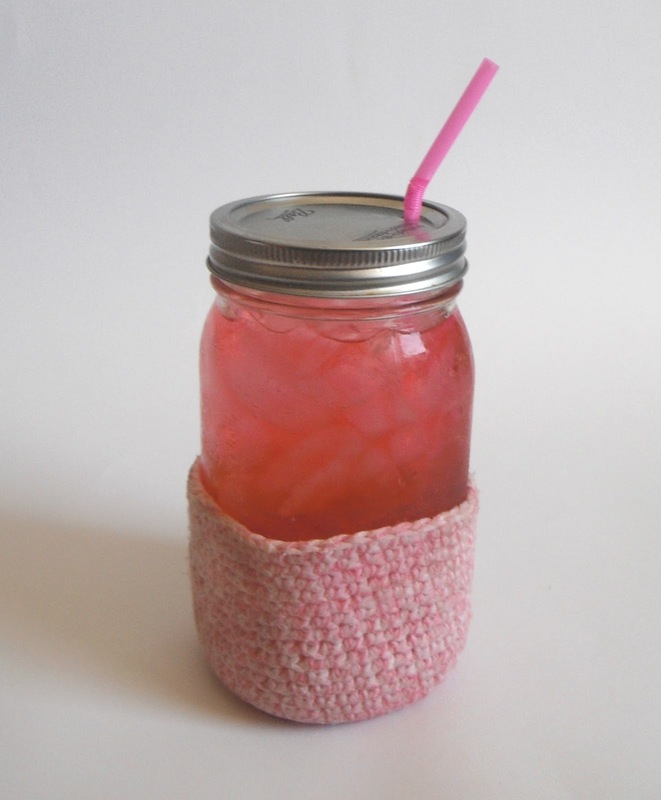 Fill a quart sized mason jar (or any other big ol' summertime cup) with ice. 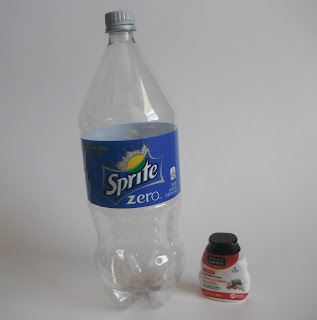 Pour in Sprite Zero to cover ice. Add two squirts of the Cherry Limeade flavoring. If you happen to have a wedge of lime, give it a squeeze and then toss it in too, because it's extra awesome with a wedge of lime... Stir with a straw, and then take it outside to enjoy while you watch the kids play in the sprinklers. 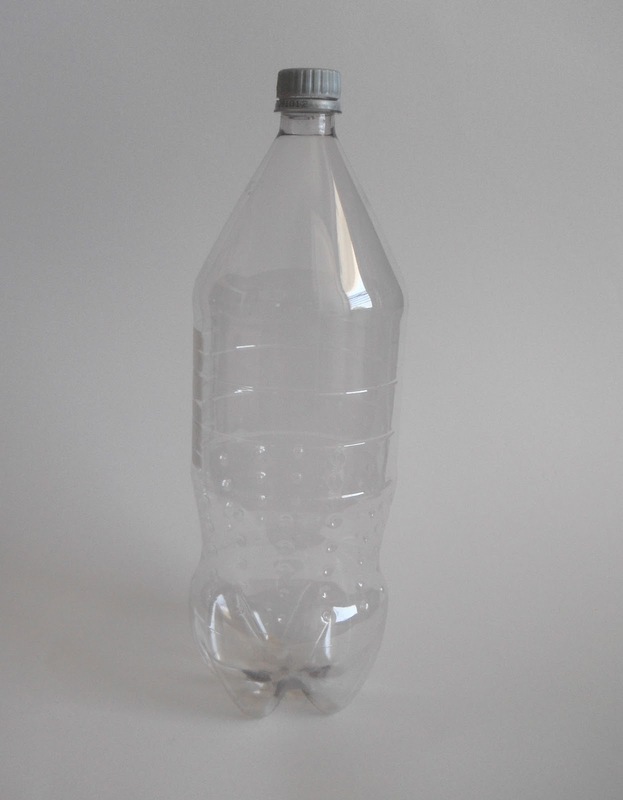 This has left us with an abundance of 2-liter bottles that we have to recycle. There's a little recycling center about five hundred feet from our house (don't ask, it's weird) which we regularly take our cans and bottles to, but there's something that I really like about the Sprite Zero bottles. They're really clear, and they've got cool texture, and grippy parts. I can't explain it. I just dig the design. So, I thought I could make something crafty and yarn friendly with these cool bottles, and recycle them in a different way. I peeled off the Sprite Zero label and discovered that underneath the bottle was segmented by little ridges. Perfect!!! 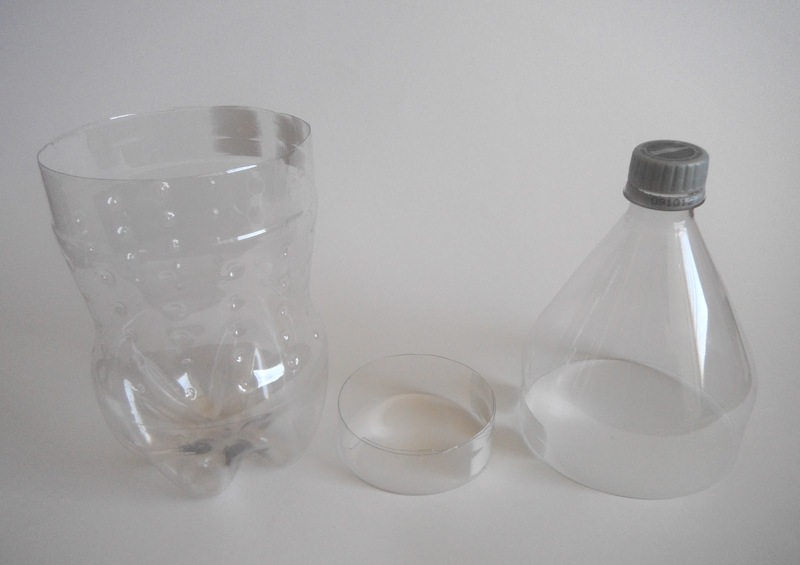 I cut the bottle apart, using the ridges as guidelines so that my cuts were straight. I cut the bottle at the top ridge and at the middle ridge, which gave me three pieces to work with: the top, the bottom, and then a little 3/4" strip from the middle. I set the middle strip aside and focused on the two big parts. You're going to need a 14" or longer zipper for this project. I used an 18" zipper, because that was what I had. The circumference of the bottle is 13" so we're going to have to customize the zipper, like how I showed you when we made the Work-In-Progress Bag. But first, we're going to hot glue! Hot glue the zipper to the bottom section of the bottle (quick reminder, it's really hot! Be careful, Dynamos!). You want to try to get the teeth fairly near the edge of the bottle, so that it's neat and lined up. When you get close to the end (beginning!) stop a half an inch or so before you reach the teeth where you started. Give yourself a little bit of space, maybe a quarter of an inch, and then sew across the zipper teeth to create a new end to your zipper. Snip off the excess, and melt the edges to keep it from fraying. If you want to get fancy schmancy, you could crochet a little end cap for this flappy, slightly unsightly, end of the zipper. Otherwise, let's just move on. 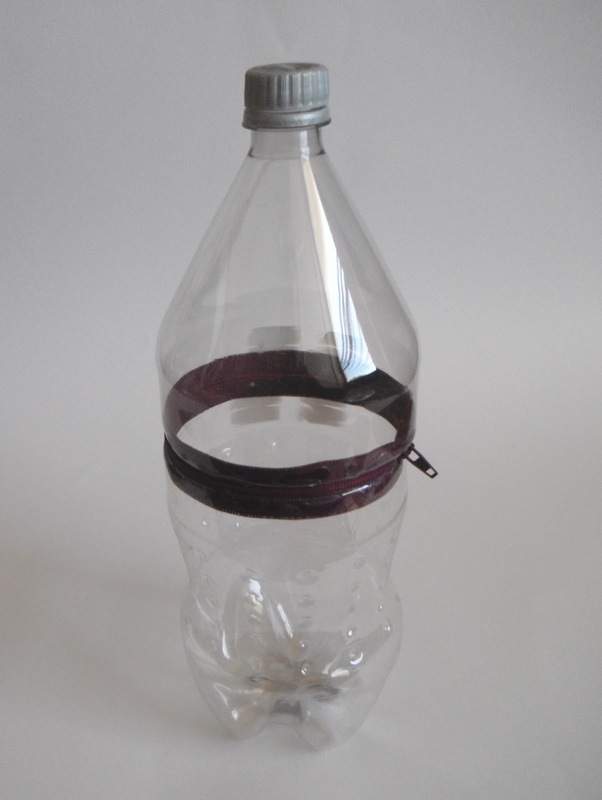 Now you're going to hot glue the other side of the zipper to the top part of the bottle. This is slightly trickier, since you will have to unzip the zipper to glue it in, and so your zipper to hot glue ratio is going to be a little worse. Be extra careful. But on the bright side, it doesn't matter where you start gluing, since you don't have to line up sides or anything. Yippee! Try not to get glue on the zipper teeth. This is important, since the first couple of times you zip/unzip the zipper it's going to be tough anyway. Hot glue on the zipper track just makes it that much harder. I got one little bonus blob of glue that completely bogged down the works until I snipped it off with some tiny scissors. Learn from my mistakes, Dynamos! Take care of your teeth! LOL! 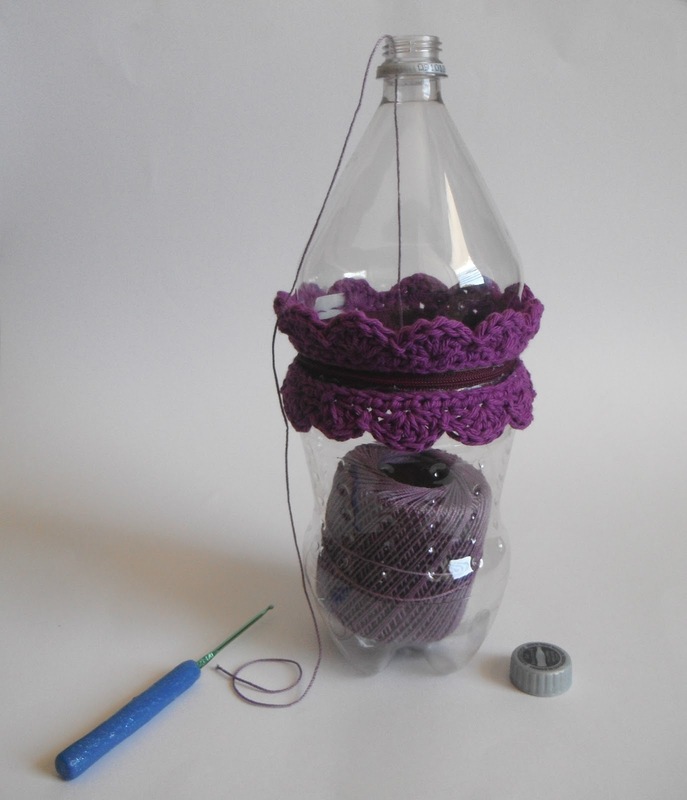 This is what your finished Yarn Holder should look like. 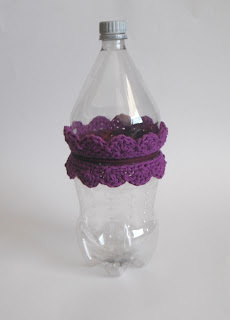 Unless you used a different color, in which case, your Yarn Holder is going to look different - but similar - to this. 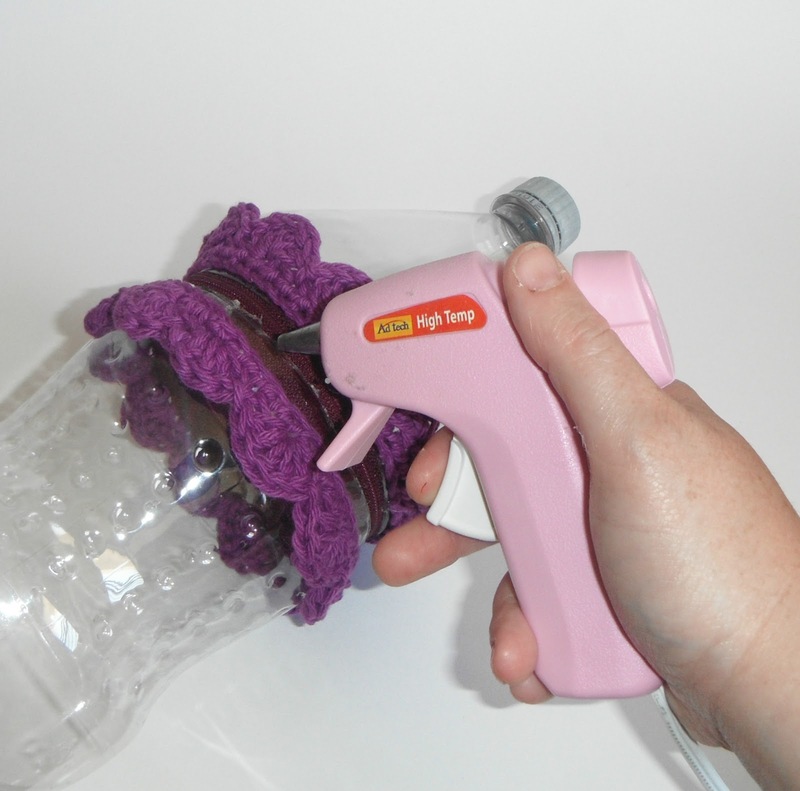 The Yarn Holder in action! I am very happy with how it turned out. I think I'm going to make several more, since they will be perfect for multi-colored work. And, most importantly, my yarn isn't going to roll around on the floor of the car when I go to the drive-in now. P.S. Don't throw away that 3/4" strip of plastic from the middle of the Sprite bottle. I've got a project that uses it coming up on Thursday. In the meantime, have a happy 4th of July! My mom votes for Zipper Edging! This is so cute, I always have the hardest time throwing things away because I'm sure they can be repurposed, and this proves it! this is just too good!!! thanks for sharing and inspiring! Hi yarn_lady! Thanks for checking it out! Thrifty yet practical. I really like it!!! dynamos dynamic from zero to hero yarn holder? hmmm thats a lot to type huh? Ahahahahahaha, Tami! That is quite a tongue twister! Love it! What a fantastic idea, so clever. I will be doing this for sure, I have those 3 liter bottles in mind, with a few 2 liters. Thank you for posting and sharing. And cheers to you, Emma! Thanks for the kind words! Happy, happy New Year! Thank you. Much needed idea. What a smart idea! I love this and am going to try it. Thank you so much for sharing this. If you screw the lid back on with a little of the yarn tail hanging out, the tail won't fall back into the bottle, so you won't have to open it up to dig it out, and you won't have to have a bunch of tangled ends in your basket of bottles. Fabulous idea by the way! I know this post is old, but I wish I had this when I was crocheting outside last night. It would have kept my stress level down from when I dropped my ball on the porch and across the mulch. If I would have had this, that wouldn't have happened. I purchased your argyle ebook last night. I love your work and so happy to have found you. Can you use the same idea for Chunky yarn? 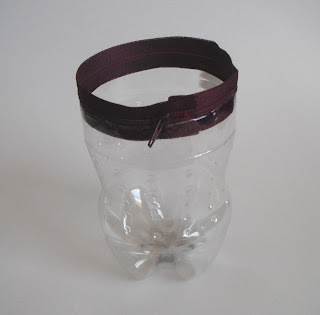 Great idea but since you are going to make a zipper flounce anyway, wouldn't it be easier to hot glue the zipper to the outside of the bottle ?